B2B markets are fundamentally different from consumer markets. Decisions are made on value, not impulse. Buying cycles are complex, often with many stakeholders involved. Relationships and support are critical. Bet-the-business decisions demand discipline, knowledge, and lots of information. Social media visionary Paul Gillin and strategic marketing consultant Eric Schwartzman have teamed up to present research, stories, and recommendations targeted exclusively at B2B companies. Social Marketing to the Business Customer presents a compelling case for using social media to revolutionize customer outreach, bringing companies in contact with their customers in unprecedented ways and creating dialogues that drive repeat business and reveal new revenue opportunities. "Gillin and Schwartzman not only dispel the myths that social media are limited to B2C marketing, they demonstrate how business customers are redefining the boundaries for influence, decision making, and lead generation." "Business-to-business marketing, like football, is a game of inches. It requires chipping away at a customer a bit at a time to build a relationship and close a sale. It requires patience, people and practice. Social media - in many ways - makes B2B marketing easier and measurable. However, it also makes it more challenging - requiring companies activate employees as thought leaders to build trust. Through rich case studies and stories from diverse industries, Gillin and Schwartzman demystify the process and show how it's done while offering a solid guide to the various technologies, tools and platforms. "While most of the social media hoopla to date has been in the consumer space, social media will have an even larger impact on B2B companies seeking to build deep, long-term relationships with their customers. This book is extremely timely as a guide on how to do just that. If you’re in the B2B space and looking to grow your business, this is the book for you. "If your company is still blocking access to social networking sites or considering them as a 'productivity drain', think twice! For many B2B companies it is THE new way to engage with customers, communicate with suppliers and generate leads. A solid social media presence is the only way to open and humanize your business and master crisis communication. This books shows you with very practical examples that there is no good reason not to use social media." "If you want truly expert advice on selling the value of social media to the CFO of a B2B concern, stop everything and READ THIS BOOK." 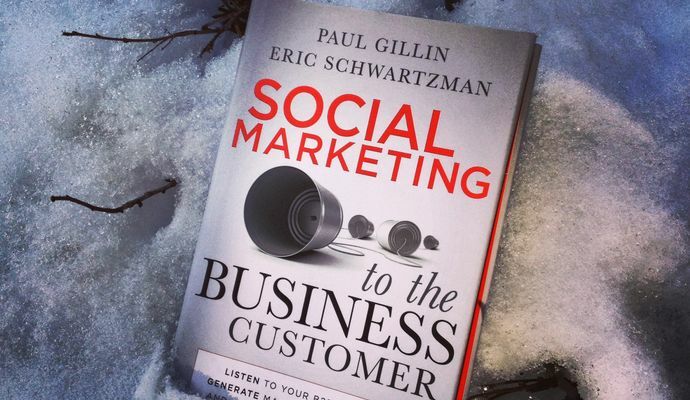 "Eric Schwartzman and Paul Gillin have written the definitive guide to social marketing to the Business Customer. There are many transferable insights that nonprofits can use." Part One: Setting the Table. Chapter One The Changing Rules Of B2B Marketing. Chapter Two Seven Ways You Can Use Social Media. Chapter Three Winning Buy-In and Resources. Chapter Four Creating a Social Organization. Chapter Five Creating & Enforcing Social Media Policies. Chapter Six Learning by Listening. Chapter Nine A Non-Techie's Guide to Choosing Platforms. Part Three: Going to Market. Chapter Ten Social Platforms in Use. Chapter Eleven Pick Your Spots: Planning Social Marketing Campaigns. Chapter Thirteen Profiting From Communities. Chapter Fourteen Return On Investment. Chapter Fifteen What's Next For B2B Social Media? Appendix A Elements of a Social Media Policy.